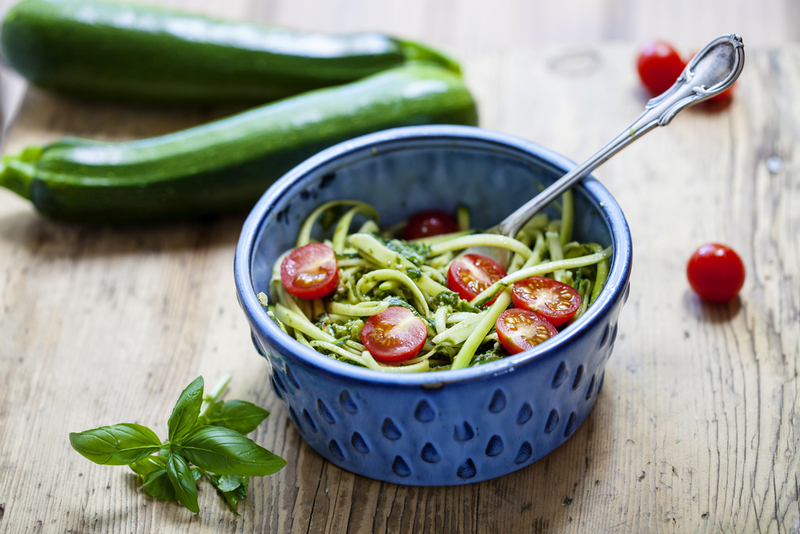 You can prepare your zucchini using a spiralizer or cut into think slices and then slice it lengthwise again to make it into a noodle like shape. Transfer zucchini noodles to a large bowl and add the greens. To prepare the pesto in a small food processor, process almonds, garlic and salt until almonds are finely ground. Add 1 cup basil, avocado, oil and lemon juice and process until well combined. Add 2 or more tbsp of water and process until combined. Add additional 2 tbsp water and process until well combined. To control the consistency add one tablespoon of water at a time. To prepare the pesto in a small food processor, process almonds, garlic and salt until almonds are finely ground. Add 1 cup basil, avocado, oil and lemon juice and process until well combined. Add 2 or more tbsp of water and process until combined. Add additional 2 tbsp water and process until well combined. To control the consistency add one tablespoon of water at a time. Add desired amount of pesto to zucchini and greens mixture and toss to coat. Divide among serving bowls. Garnish with tomatoes, carrots and chopped basil, if desired.